Available only in the New York, Chicago, Kansas City and Seattle regions. AVAILABLE ONLY in Orlando. Effective 9/10/01. 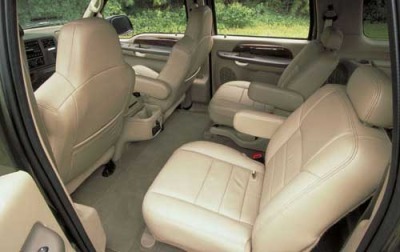 REQUIRES 6.8L engine or 7.3L engine. REQUIRES 91E. Available only in the following regions; Orlando and California. 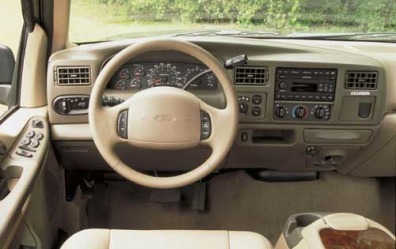 Includes AM/FM stereo, in-dash 6-CD player and clock. Includes power, heated, manual telescopic, forward fold mirrors for trailer towing. Available only in the Orlando region. 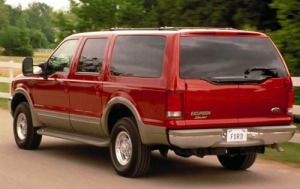 Includes monochromatic paint treatment including body-colored grille, lower body color cladding, body color bumper coordinated color lower valance panel, unique two-tone leather-trimmed captain's chairs, cherry wood grain pattern interior trim and reversible cargo mat (carpet/rubber). Available in Aspen Green [P5], Ebony [UA], or Mineral Grey [TK] paint. AVAILABLE ONLY in Twin Cities, California and Southwest. Effective 9/10/01. REQUIRES 915. Included as standard equipment in the following states; AK, MN, ND, SD, MT, WI and WY. Includes 7" flip-down color video monitor, two 8-foot wired stereo headphones with automatic shutoff feature, remote control, "dual play" and "single play" audio feature and an input for home video systems.